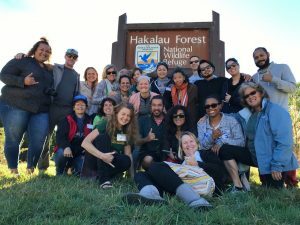 The Teaching Change program (http://www.teaching-change.org/) recently ran its 3rdannual Teacher Training Workshop on March 9–11, 2017 at Hakalau Forest National Wildlife Refuge and the Institute of Pacific Islands Forestry. These annual workshops integrate a teacher education and curriculum development component into our existing youth education program in natural resource management that is focused on place-based, outdoor, immersive, experiential youth education. The overall goal of these workshops is to provide secondary school Science, and Career and Technical Education teachers from Hawaiʻi with the background and knowledge to develop and implement immersive curricula focused on global change (i.e., climate change, invasive species, and land-use change) using phenology (the timing of life cycle events) of native trees to teach core STEM concepts aligned with Next Generation Science Standards. The event brought together 22 teachers from the Islands of Hawaiʻi and Oʻahu. Of these teachers, two were Master Ecoliteracy Teachers (i.e., teachers familiar with the overall Teaching Change program) for peer-to-peer mentoring on curriculum development and implementation. In early Fall 2017, we will reconnect with these teachers for presentations on the curricula that they will have developed to get their students outside and engaged in immersive, experiential education opportunities. In May 2017, Dr. Ming Wei conducted several follow-up school visits with the teachers who attended the 3rd annual Teacher Training Workshop. The teachers were very excited to apply what they learned. For example, one teacher partnered with an ʻāina-based education organization (ʻāina ‘that which feeds us’) and took all the 7th graders from his school on a hike to discover changes in the area by looking at the phenology of the trees. This was the first field trip for his students for this whole school year. Another teacher partnered with NOAA to include phenology into the NOAA place-based curriculum for 8th grade. These students observed the phenology of marine creatures and ocean-side plants, noting shifts in bloom or reproduction times. Teaching Change was initially part of PCEP’s Hawaiʻi Island LPLC. In 2016, PREL partnered with UH Mānoa, Hakalau Forest National Wildlife Refuge, and the Institute of Pacific Islands Forestry and successfully wrote for and received a USDA grant to continue this work beyond PCEP. © 2019 CCEP Alliance · All web pages and assets are provided "as-is" with no warranties, expressed or implied. Most of the content on this website is provided by third-party organizations and other users. URI, GSO, and the ISC are not responsible for user-uploaded content on this website. If a copyright concern arises, please contact the site administrator, who will remove such content promptly. In no event shall URI, GSO or the ISC be responsible for damages arising from user-uploaded content.